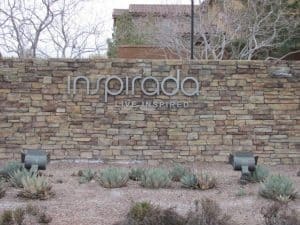 Inspirada master-planned community is located in Henderson, NV and was the first development to follow the “new urbanism” guidelines. Inspirada real estate began in 2007 and is planned to have more than 13,000 homes located in seven distinct villages. Utilizing the urban guidelines, this community will be unique in greater Las Vegas by having rear alley garages and front porches that are designed to be more neighborly. In the center of the villages will be a convenient town center commercial district with restaurants, markets, and retailers. This area will include high density work/living areas and approximately 200 acres of parks and public use areas to endorse a tight nit community lifestyle. Inspirada real estate is unique with its beautiful views as it’s located at the base of Sloan Canyon National Conservation Area with 48,438 acres of federally protected desert canyons and ancient petroglyphs. Archaeologists believe that more than 300 rock art panels with 1,700 individual design elements were created by native cultures from the Archaic to historic era. Motorized travel is not allowed, but activities such as hiking, horseback riding, and wildlife watching are encouraged. Inspirada real estate is in the 89044 zip code in Henderson, NV.